MARCH 19: The deal has now been announced. MARCH 16, 6:31pm: It’s a minor league deal that includes an early April opt-out date, Bob Nightengale of USA Today tweets. The contract comes with a $2MM major league salary and $1MM in incentives, per Heyman. 6:16pm: The Indians are closing in on a deal with free-agent outfielder Carlos Gonzalez, according to Jon Heyman of MLB Network. Jorge Urribarri first reported the connection. Prior to Saturday, it had been a quiet few months for Gonzalez, a Boras corporation client who seemingly hasn’t drawn much serious interest since he reached free agency last November. 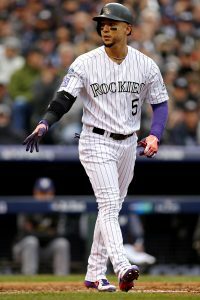 The 33-year-old is coming off a mostly successful tenure in Colorado, though, having batted .290/.349/.516 with 227 home runs and 118 stolen bases over 5,069 plate appearances since 2009 – his first season with the Rockies. The three-time All-Star has typically fallen short outside of the hitter-friendly confines of Coors Field, however, evidenced by his .323/.381/.592 lifetime slash at home against a .251/.307/.420 showing on the road. Moreover, the left-handed Gonzalez has underwhelmed against same-sided pitchers, who have held him to a .261/.297/.434 mark. It was more of the same in 2018 for Gonzalez, who slashed a decent .276/.329/.467 with 16 homers in 504 PAs but did most of his damage at home and against right-handed pitchers. Meanwhile, CarGo was a mixed bag in upward of 1,000 innings in right field, where he recorded a woeful DRS (minus-eight) but a strong UZR (4.8) and a respectable Outs Above Average mark (one). Historically, Gonzalez has performed well in the outfield, as shown by his 16 DRS and 26.2 UZR in 1,271 career appearances. Gonzalez, who was with the Diamondbacks and Athletics prior to his Rockies stint, is now joining his fourth major league organization. Even though Gonzalez didn’t land a guaranteed deal with the Indians, he still may have a realistic shot to crack their roster early in the season. The outfield has been a glaring weakness in Cleveland for a while, after all, yet the club didn’t make any major additions to it before signing Gonzalez; further, the Indians lost Michael Brantley, Lonnie Chisenhall, Brandon Guyer and Melky Cabrera in free agency, and Bradley Zimmer is still on the mend from July 2018 shoulder surgery. As a result, the Indians are projected to open the season with the unspectacular Leonys Martin–Jake Bauers–Tyler Naquin–Jordan Luplow quartet, which seems to leave room for Gonzalez to work his way back to the majors in short order. The Yankees still want to boost their rotation depth, Heyman says, though it’s a bit unclear as of yet how they’ll go about doing so. He lists Gio Gonzalez and Ervin Santana as at-least-hypothetical targets, but it stands to reason that both will want to sign somewhere that they’ll be promised a rotation spot. Gonzalez is one of the best remaining starters and should have little trouble finding at least a clear rotation placement, if not a multi-year deal. Santana does seem to be an interesting bounceback candidate, but he’ll surely be seeking a chance to take the ball every fifth day, which the Yanks can’t promise. Unsurprisingly, the Giants appear to be hunting for value on the market in their search for a new slate of outfielders. That seemed reasonable to suspect when last we checked in on the situation, as the San Francisco organization seemingly wants to remain competitive while also embarking upon an effort to get younger and enhance payroll efficiency. There could be some interesting free agent opportunities, though perhaps the most intriguing possibility would be for the Giants to pick up some pieces that become available after late-breaking signings. The Rockies have some level of interest in yet again bringing back outfielder Carlos Gonzalez, Heyman adds. This particular item is frankly difficult to understand, as the Rox are working with a limited budget and still need to improve behind the dish, in the bullpen, and perhaps on the bench. Meanwhile, the team has a nice assortment of left-handed-hitting outfielders already on hand, making the veteran former star a tough fit on paper. In any event, other teams are also said to be interested in CarGo.